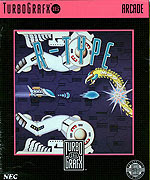 I love the original R-Type. I originally played it on my friend's TurboGrafx-16 back in 1990, and the TG16 version remains my favorite. I still have my TG16, and occasionally hook it up to get my R-Type on. The original was so unforgiving- the TG16 version had one cheat- to get more continues (up to about 30). That was it. That game is so hard that to this day, I have not even gotten to the last stage. But the playthrough experience is so enjoyable because all the enemies move in patterns, so playing through is almost like a dance- you play your part, the game plays its. Of course I love all the art designs (and the first boss is a doppleganger for H.R. Geiger's Alien). The level design is really cool, too. Level 3 remains my favorite level of any game. The entire level is a giant ship with turrets and gun ports. You go around it destroying guns and chunks of the ship, and the boss is the core of the ship. As you play through the level, you upgrade your weapon by picking up orbs. You always have the choice between firing fast, weak shots, or charging up your shot to a rather powerful-looking shot. The different colored orbs add in different effects, like lasers that bounce around or ones that fire straight forward, or ones that go straight up and down and follow the sides of the level. You can also pick up missiles and up to two "options", that are like mini-orbs that always orbit around the top or bottom of your ship, providing defense and additional firepower. The element that sets R-Type apart from other side-scrolling shooters is the force. It's this round, invincible pod that has several uses. First, it's a shield. All bullets that hit is are destroyed. Some types of lasers and boss attacks go right through it, though. Second, it fires with you. As you power up your lasers, it powers up as well- when detached, it shoots up & down, as well as forward. Because of these properties, it adds a lot of strategy. You can attach it to the front or back of your ship to defend it from bullets. Or you can shoot it out in front of you, to get it in a position to damage bosses that might be otherwise inaccessible. 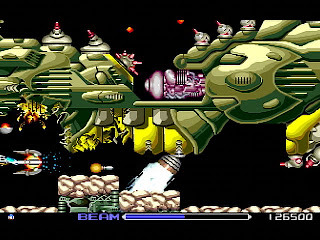 If you like R-Type, irem has sound effects/background music! I give R-Type a 5/5. The makers of R-Type Delta definitely had a good grasp on what made the first one great. All the great things from the first were improved. The whole game is amazing. They added 3 ships to choose from (4 once you unlock it), with different forces that behave in different ways. The forces now absorb energy from the bullets, like a capacitor, and once charged can unleash a super weapon. The entire game is in 3d, and used to good effect. The playing field is always 2d, but the camera will move around to change the direction of the ship. They also have a level with an homage to the great bosses from the original R-Type. What Super Mario 64 did for the Mario franchise, and what Ocarina of Time did for the Zelda franchise, R-Type Delta did for the R-Type franchise. It was both an evolution and a revolution. I give R-Type Delta a 5/5. 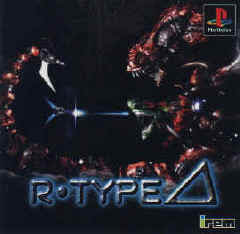 R-Type Final is merely ok- rather disappointing after the genius that was Delta. It didn't change much from Delta. Some of the levels are really cool- one level (Twisted Ecology) changes from a swamp to a desert to underwater to frozen depending on how you beat the boss the last time you played. Other levels are cool, but a lot of the themes are pretty bizarre. The problem that I have with Final is the emphasis on unlocking ships- some of the ships are pretty cool, but others are pretty much the same as others with only small variations. Some of the ships' unlocking requirements are pretty time consuming to unlock- play for 90 minutes after unlocking one ship, for instance. And there are 101 ships! Someday, I must finish getting all of them. 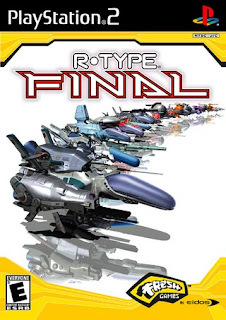 I give R-Type Final a 4/5.